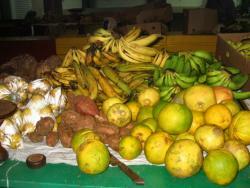 The market is a place you must visit when in Antigua, particularly on Saturday mornings. The market is opposite West Street Bus Station and opens from early in the morning. If you visit from 5.30am on Saturday morning, you will be astounded at the crowds of local villagers arriving with fruit and vegetables to sell, and empty shopping baskets to fill. The market hall is relatively new, as the market used to be down the road outside. On Saturdays however there are many stall holders who set up their wares outside the market. 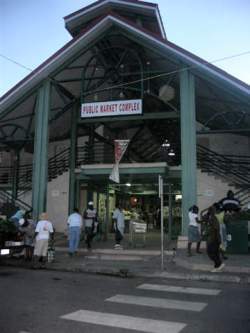 Every stall sells different produce, breadfruit, mangoes, soursap, sugar apples, pineapples, dasheen, tamarind are just a few of the locally found fruit and vegetables. The vendors’ will jostle for your attention by showing you some of the local fruits and vegetables – if you don’t recognise them –just ask. The vendor’s are only too willing to explain how to eat and cook the food, so it’s a great way to meet people and learn about Antiguan cooking. There is also a smaller craft market attached to the main market where you can find locally made arts and crafts.